Our Chantilly Lace ring features a beautiful, ornate band designed by Douglas Elliott, who was inspired by classical French interior design motifs, his love of Paris, and his wife Marisa Perry’s French heritage. Available as a bridal set with matching wedding band. 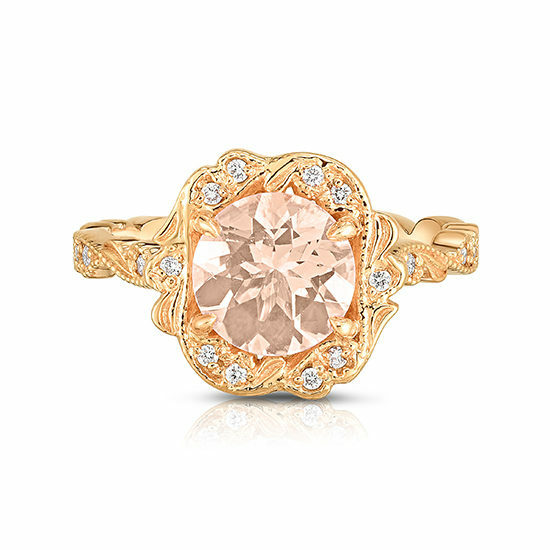 Shown here in 18k rose gold with a 1.16 carat Round Brilliant cut Morganite. This ring also features 0.13 carats of diamond accents on the band and the Chantilly Lace halo. In stock in size 5.25. Available as a custom order in any finger size and carat weight. Ships In: Ships within 5 business days of confirmation of payment. Custom crafting can take up to 6 weeks and will ship upon completion.